Orlando, FL—October 23, 2017— A new study conducted by the Equipment Leasing & Finance Foundation and PayNet, Inc., “The State of Credit Quality: Where We Have Been and Where Are We Going,” shows industry credit quality and performance remain strong and better than pre-recession levels. This study points towards continued better-than-historic average performance due to the economic outlook, improved underwriting and portfolio management, and better credit quality originations booked since 2010. 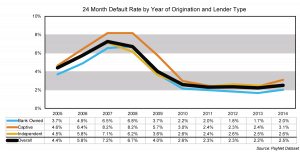 The overall 24-month default rate by year of contract origination shows dramatic improvement from 2007 to 2010 and that improvement continued through 2013 when the default rate bottomed out at 2.2%. The study reveals there was an increase to 2.5% in 2014, the last year for which there is a full 24 months of performance. Bank-Owned lenders exhibited the lowest default rates in all years except 2008 and 2009. Independents showed the lowest default rates in 2008 and 2009. Captives showed significant improvement to the point where they experienced similar default levels as Independents for 2011-2013, after suffering the highest default rates for the 2005-2009 origination vintages. However, Captives did show a meaningful increase in default rates to 3.1% in 2014. All three lender types showed increasing default rates in 2014. The percentage of originations in the low and below average score tiers, based on volume, increased from 12.8% in 2005 to 20.1% in 2008 and then back to 12.4% in 2016, while the percentage in the high and above average score tiers improved dramatically from 25.7% to 43.9% from 2005 to 2016. PayNet will provide insight at the Equipment Leasing and Finance Association’s 56th Annual Convention on Monday, October 23 at 11 a.m. in a breakout session, “Risk and Assets: An Overview and a Balanced View,” at the JW Marriott Orlando Grande Lakes. Defaults are defined as any default indicator, 90-day delinquency, equipment repossession, bankruptcy or related public record indicator reported in the PayNet database occurring within 24 months from booking date. All default rates in this study are determined using counts. See PayNet Dataset methodology in the Appendix for a detailed default definition. PayNet Inc. is the leading provider of credit ratings on small businesses enabling lenders to manage credit risk, grow earning assets and operate credit at lower cost. PayNet maintains the largest proprietary database of small business loans, leases and lines of credit encompassing over 23 million contracts worth over $1.5 Trillion. Using state-of-the-art analytics, PayNet converts raw data into real-time marketing intelligence and predictive information that subscribing lenders use to make informed small business financial decisions and improve their business strategy. For more information visit www.paynet.com.